Home / Travel / Bang Luang Canal floating market in Bangkok. Genuine, quiet, floating market in Bangkok. This photo blog post is about one of a few genuine, quiet, local, floating markets in Bangkok (Thailand). Bang Luang Canal or คลองบางหลวง (Klong Bang Luang) in Thai language. If you’re looking for the most touristed floating markets outside Bangkok then, I’m afraid, you are in the wrong place. 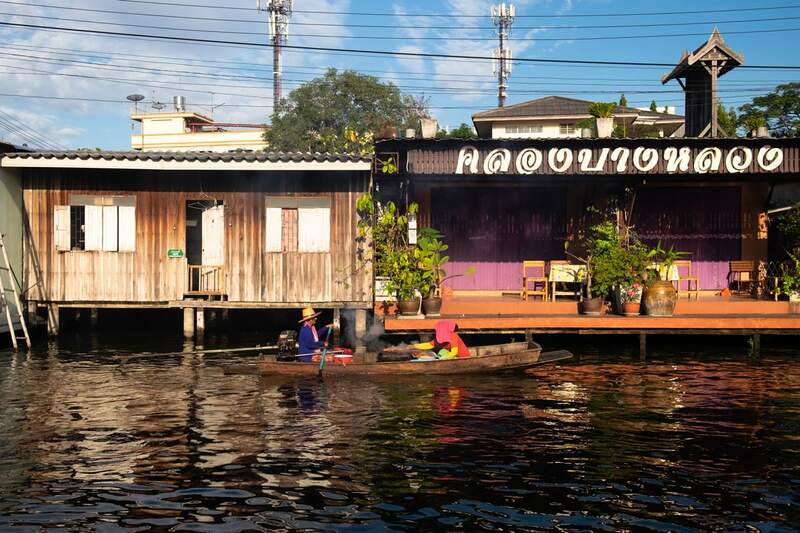 This blog post showcases a selection of images about people’s daily life around this authentic, small, off the beaten path, floating market in Bangkok. There are lots of meandering canals in Bangkok and because of that it’s called the Venice of the East, Bang Luang Canal is one of them. It’s close to where I live in Bangkok and on the weekend sometimes I go there for lunch. As a matter of fact, there are a few Thai restaurants and cafes all by Bang Luang Canal. It’s the perfect place to spend half day walking by the canal and sit at one of the few cafes for refreshments or a meal. Or, you can just sit by the canal and enjoy the view of a genuine, quiet, local, floating market. Tourist long-tail boat on Bang Luang Canal. 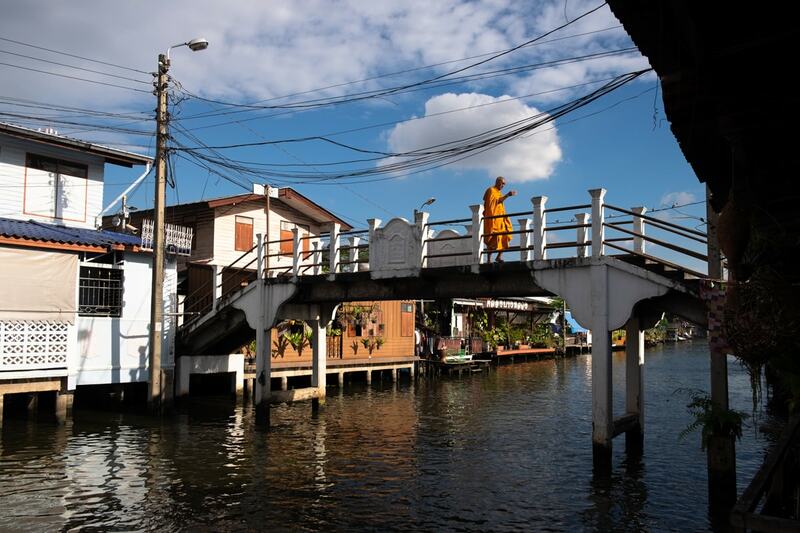 A Buddhist monk crosses Bang Luang Canal over a bridge. Two tourist long-tail boats on Bang Luang Canal. Colourful tourist long-tail boat on Bang Luang Canal. A wooden house on the canal named Artist’s House is a small venue for Thai traditional dance and puppet show also recognised by UNESCO as an intangible cultural heritage. You can sip your coffee while watching the show. And if the show is not on, not to worry, you can still look at some of the artists rehearsing. Puppetteers rehearse at the Artist’s House. Thai traditional dancers and puppetteers rehearse at the Artist’s House. Young Thai traditional dancer rehearses at the Artist’s House. It’s an authentic, small, off the beaten path, floating market with a few farmers selling their food on little boats. So, do not expect dozen of boats that try to sell you souvenirs. 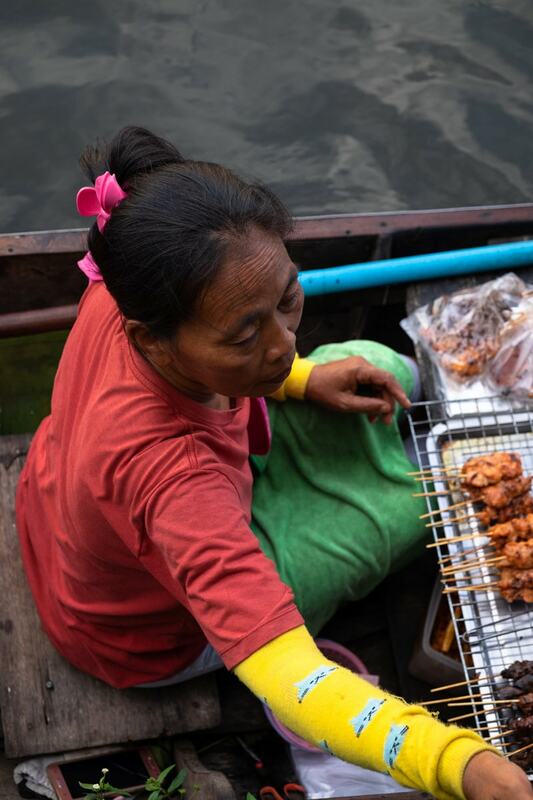 In Bang Luang Canal you can expect few farmers who sell barbecue chicken, fruits, Thai snacks and soups to locals. A customer points to barbecue chicken sold on a boat. High school students watch people’s daily life at the floating market. Thai snack vendor on a boat awaits customers at Bang Luang Canal. Fruit and veg seller on a boat gives change to customers. Fruit and veg vendor on a boat gives change to customer. Thai snack vendors on a boat approach the banks of Bang Luang Canal. Thai snack vendor on a boat. Barbecue chicken sellers on a boat. Barbecue chicken sellers serve a local on his stilted house. Barbecue chicken sellers serve a long-tail boat driver. Barbecue chicken seller on a boat on Bang Luang Canal. Barbecue chicken sellers on a boat serve people on the banks of Bang Luang Canal. 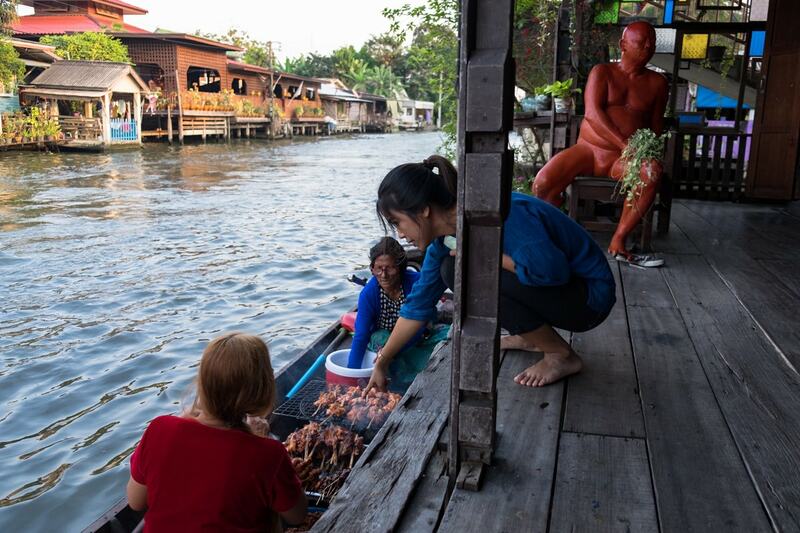 Barbecue chicken sellers on a boat on Bang Luang Canal serve people. Barbecue chicken seller on a boat serving people on the banks of Bang Luang Canal. Barbecue chicken seller on a small boat on Bang Luang Canal. Barbecue chicken sellers on a boat on Bang Luang Canal. For more photos about travel photography visit the page Travel on this site.